Is Healthy Food Doing You More Harm Than Good? My problems with digestion started when I was a kid. Before school, I would usually have cereal for breakfast. My mom didn’t often buy the ‘sugar bomb’ kind of cereals like Lucky Charms, Cinnamon Toast Crunch and Cap’N Crunch. She bought ‘healthy’ cereals like Life, Honey Bunches of Oats, and Raisin Bran. But I remember one time, after eating Raisin Bran, I slid to the ground and curled up in the fetal position because my stomach hurt so much. It was like eating glass and it felt like the cereal was tearing my intestine as it traveled through. After thirty minutes and a bit of gas I’d usually be good to go, and I wouldn’t think about my stomach pain until the next time I ate this ‘cereal of death’. Growing up, I hated eating. I was always skinny, which had everything to do with not liking to eat, but now I question whether that was because I really didn’t enjoy eating or because it actually hurt so much that I just wanted to avoid it. If you’re skinny, you may have the same problem that I had. As I progressed and learned more about nutrition, I realized that these ‘healthy’ foods weren’t really healthy at all. They are filled with processed ingredients like modified corn starch, sugar, artificial flavors and other ingredients that have actually been removed from the products in other countries. Ok, so eating unhealthy, processed foods is bad for you. Got it. That leaves whole foods as the option, right? The problem with telling someone to eat just ‘whole, unprocessed foods’ is that nutritional needs are so specific to the individual. People come from ancestral lines that have adapted to eating a certain way for thousands of years, so digestive tracts have become used to eating a certain way too. I am half Lithuanian and half Dutch, and these people have simple diets. It’s why my stomach hurts when I eat Chinese food, and why I feel super bloated when I eat Italian food. Sorry, pizza; I miss you sometimes, but you’re just not worth it. My point is that each person is different, and this needs to be taken into account. Six months ago, I started to notice that I was visiting the toilet quite frequently. At first I didn’t pay much attention to it, but as it became more and more frequent, I got a little frustrated. I did what any analytical guy would do. I started tracking my food and my bowel movements. Sounds fun, right?! 😉 It wasn’t. For several weeks I could not find out what the heck was wrong with me. I changed my diet. I ate super healthy food. I took probiotics. But I still had the runs, and a lot of them. Pretty much every potential cause crossed my mind. Parasites, ulcerative colitis, Chrons disease… you name it, I thought it. I went to my doctor and he suggested taking a full spectrum food allergy test. He said that it was time to really hone in on my diet. Elisa Technologies offers a full spectrum food allergy test that will tell you what foods you are allergic to. You prick your finger and put a drop of blood on five circles. After sending it to the lab, they run some tests and send you a list of foods you are allergic to. I was dumb-founded when mine came back. Shows that I am highly sensitive to cranberries, dairy and eggs. Shows that I am highly sensitive to almonds. As you can see, I found out that I’m highly sensitive to eggs, dairy, almonds and cranberries. Since I was eating all of these foods on and off, it was no wonder that my gut was inflamed. This also explains why cereal was such a killer for me. I would pour dairy on my cereal and often put either shaved almonds or cranberries on it. Doh! The crazy thing is that I have always seen these foods as ‘healthy’. And in fact, they ARE healthy, just not for me. For someone else, they could be super healthy. Before I eliminated these foods my doctor did a BIA (Bioelectrical Impedance Analysis). This measures a lot of biomarkers of health in the body. 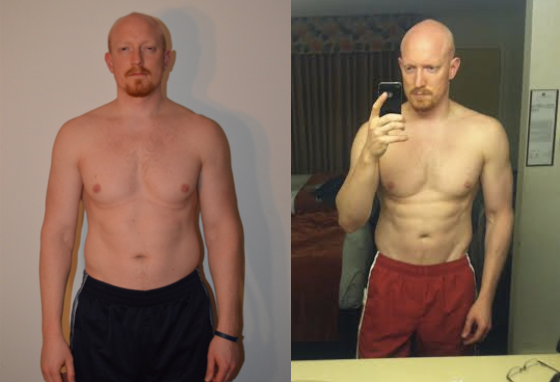 He then did a BIA one month later, and the results were amazing. I’ve included images of the tests below. Notice the significant drop in body fat, increase in lean muscle mass, increase in phase angle (a measurement of cell size and the speed at which cell regeneration occurs), and increase in basal metabolic rate (the rate that your body’s metabolism burns calories; a higher number is better). 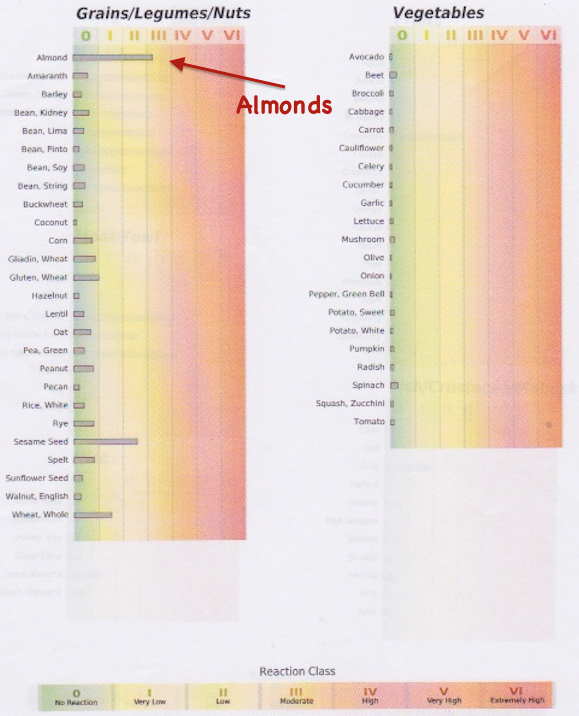 This is a BIA Test that showed the power of removing allergic foods from my diet. 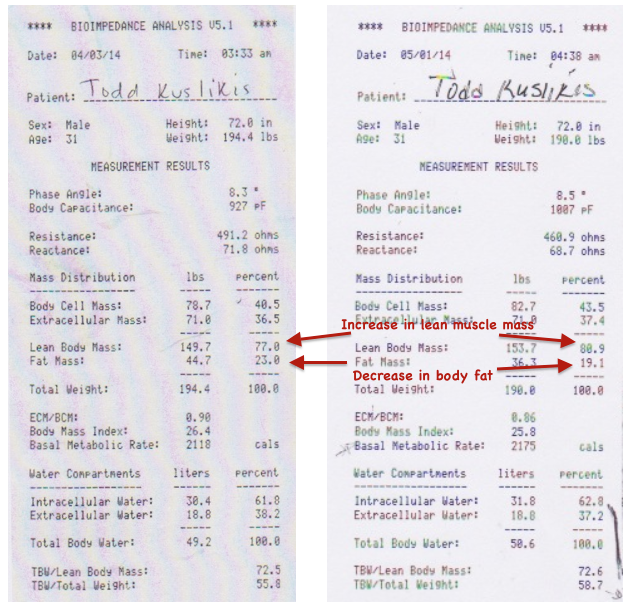 The image on the left shows a higher body fat and lean muscle mass as well as other non-optimal health markers. The image on the right shows how much difference can occur in one month. If you are suffering from severe stomach pain or frequent visits to the toilet, you may be allergic to something in your diet. 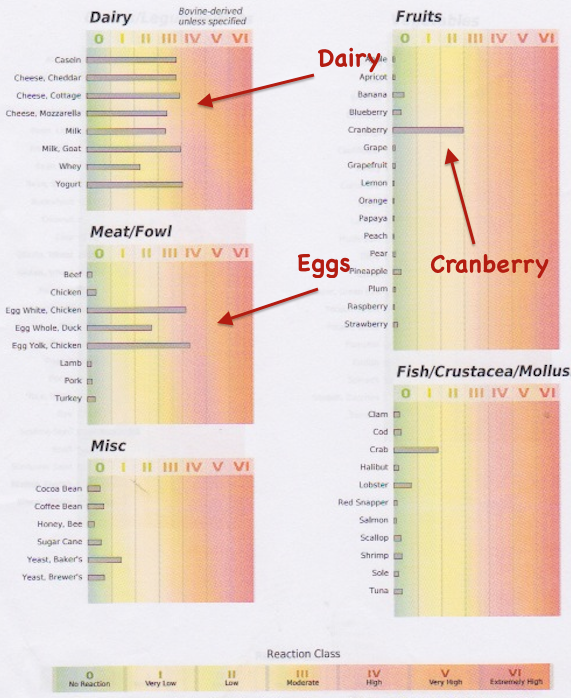 Trying to remove things from your diet in a hap-hazard way can be frustrating, so if you have a doctor’s office that can do a full spectrum food allergy test, I highly recommend it. Mine cost around $150 and it was so worth it. The best part is that I feel great! Nutrition is such a tricky subject. Something that is healthy for one person may be unhealthy for another, but there are general principles that apply to the vast majority of people. These include staying away from processed foods, eating an abundance of vegetables, consuming healthy fats and proteins, and a host of other universally healthy habits. 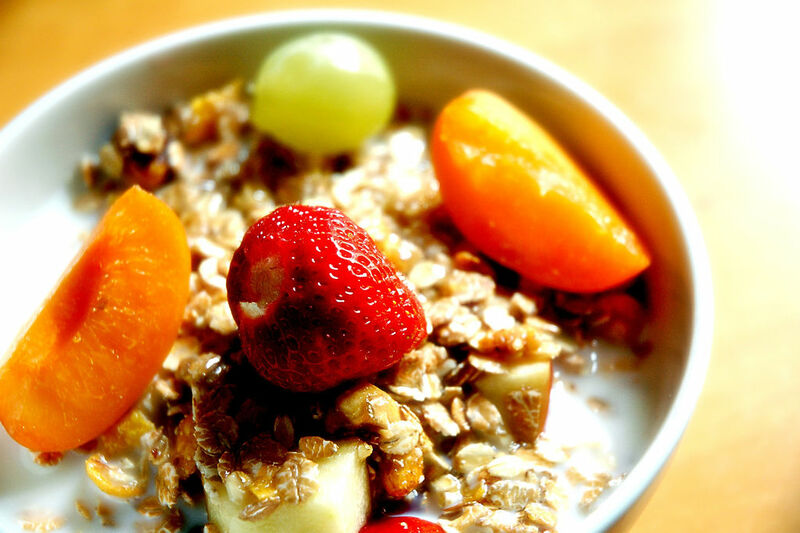 However, as outlined in this article, nutrition can be refined so that it is tailored to the individual and all of their specific, unique requirements. P.S. I almost forgot to include my before and after pictures. When I was eating ‘unhealthy’ food and not working out like I should I have been, I gained body fat. After removing the foods that I was allergic to and getting back into the flow of exercise, my body fat dropped and muscle mass increased. Great article. Any chance you could link to the specific full-spectrum Elisa Technologies test you took? I checked their website and don’t see any that cost $150. Thanks Paul. I did it through my holistic doctor. I’d recommend calling some local places to see if they offer it. Not sure if they’ll just send the test through the mail. Awesome Thank you soooo much for posting I am in my thirties and all of a sudden when I eat certain foods like raisin bran I look 8 months pregnant. Your article helped me ..